Regular use of ibuprofen may lower the risk of lung cancer among those with a history of cigarette smoking, according to research presented at the IASLC 17th World Conference on Lung Cancer (WCLC) in Vienna, Austria. It has been established that chronic inflammation appears to increase the risk of lung cancer, and medicines that reduce inflammation have been shown to reduce this risk. However, few prospective studies have examined associations between lung cancer and non-steroidal anti-inflammatory drugs. To test whether a common NSAID can reduce the risk of lung cancer, Dr. Marisa Bittoni and her colleagues from The Ohio State University in Columbus, Ohio, examined data from 10,735 participants in the Third National Health and Nutrition Examination Survey, or NHANES III. Baseline data on smoking, NSAIDs and other lifestyle variables were collected for 10,735 participants starting in 1988-1994, and cause-specific mortality status was ascertained through probabilistic record matching using the National Death Index through 2006. Cox proportional hazards regression models were used to estimate hazard ratios (HRs) to quantify associations between NSAID use and lung cancer death, with adjustment for current smoking and other variables. Over 18 years of follow-up, 269 individuals died from lung cancer, of which 252 (93.6%) reported a history of cigarette smoking. Since all but 17 of the 269 fatal lung cancer cases occurred among current or former smokers, estimates of NSAID effects were ascertained from a sub-cohort of 5,882 individuals who reported a history of past or current cigarette smoking. Bittoni found that prospective data from NHANES III showed that among adults with a history of past or current smoking, ibuprofen intake was associated with a substantial (48%) reduction in the risk of dying from lung cancer. Effects of aspirin and acetaminophen were not statistically significant. 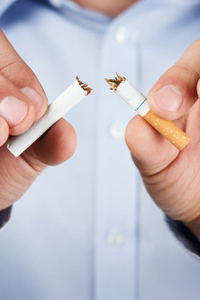 “These results suggest that regular use of certain NSAIDs may be beneficial for high-risk subgroups of smokers as a lung cancer prevention strategy,” Bittoni said.